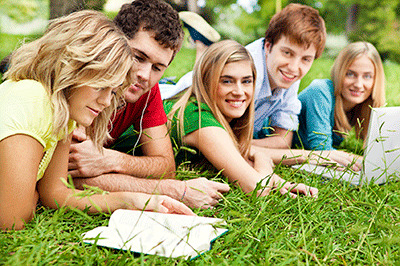 Australia has a large range of accommodation options available to international students. With choices ranging from university accommodation or homestay to self-catered apartments or share houses, there's an option to suit every personality and budget. 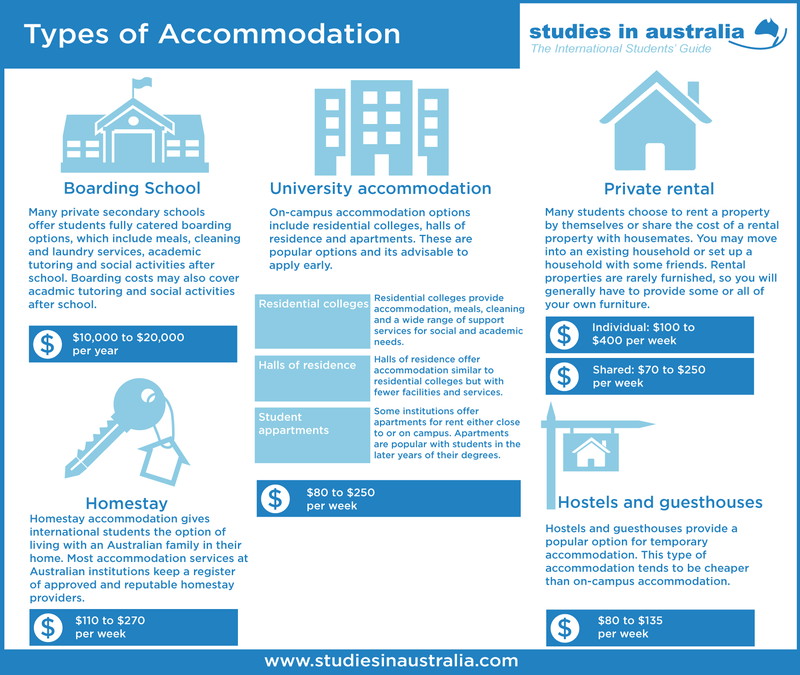 Many Australian education providers have accommodation services that offer information and advice about the different accommodation options and help students find appropriate accommodation to suit their needs. This service may also be able to arrange temporary accommodation for students when they first arrive in Australia. Students can contact their institution's accommodation service before their arrival in Australia to arrange this. To find out more about accommodation at UNSW, visit www.rc.unsw.edu.au. The cost and availability of accommodation in Australia depends on the type you choose. For instance, on-campus accommodation is very popular and requires students to apply for a room well in advance, whereas rental accommodation tends to be more readily available and can often be organised when you arrive. You will also find that costs and availability vary between states and territories, as well as between metropolitan and regional areas. Prior to your arrival in Australia, it is important to contact your education institution's accommodation service and ask about what is available and the costs involved. Many private secondary schools offer students fully catered boarding options, meaning that meals, cleaning and laundry services are provided. Boarding costs may also cover academic tutoring and social activities after school, with most schools providing a supportive family atmosphere. Depending on the school, there may be shared or private rooms. Tuition fees are charged in addition to the boarding fees. On average, boarding school accommodation fees are around AUD$11,000 to $22,000 per year. Homestay accommodation gives international students the option of living with an Australian family in their home. Single or shared rooms may be available, and costs vary according to the type of room (usually around AUD$235 to $325 per week). Meals are usually included in the cost, although self-catered homestay is also available. This type of accommodation is popular with secondary students and those studying short-term English courses. Most accommodation services at Australian institutions keep a register of approved and reputable homestay providers. The prices and accommodation options at residential colleges, halls of residence and apartments vary between institutions, so you should contact the institution you're interested in for full details. These options are very popular, so it's a good idea to apply early. On average, on-campus accommodation costs around AUD$90 to $280 per week. Residential colleges provide accommodation, meals, cleaning and a wide range of support services for social and academic needs. They are generally more expensive than halls of residence because of the range of facilities and support services offered. Most offer private rooms, with shared bathrooms, dining halls and recreation areas. Halls of residence also offer accommodation and a lively social atmosphere, but with fewer facilities and services included. Some meals and cleaning services may be included, but self-catering facilities are provided, enabling students to be more independent. Most offer private rooms, with shared bathrooms, kitchens and recreation areas. Some institutions also offer apartments for rent either close to or on campus. This provides students with the security of institution-approved accommodation, but with the increased freedom of fully self-catered living. Single and shared apartments are usually available. Apartments are popular with students in the later years of their degrees. Many students use hostels and guesthouses as temporary accommodation. Most offer private rooms, with shared kitchen and bathroom facilities. Residents cook for themselves. This type of accommodation tends to be cheaper than on-campus accommodation (at around AUD$90 to $150 per week) and still provides good opportunities for social interaction. Many students choose to rent a property by themselves or share the cost of a rental property with housemates. You may move into an existing household or set up a household with some friends. Rental properties are rarely furnished, so you will generally have to provide some or all of your own furniture. Rental agreements usually require payment of rent in advance, as well as a security payment called a bonde (usually one month's rent) that is paid up-front. You will also need to pay bills for electricity, gas and water. Your institution's accommodation service can help with finding rental accommodation and provide information about your rights and obligations. Rental properties or rooms are advertised on student noticeboards, websites (such as realestate.com.au and domain.com.au) and in newspapers. On average, rental accommodation costs around AUD $165 to $440 per week and shared rental accommodation costs around AUD $85 to $215 per week. Cost estimates were sourced from the Australian Government's Study in Australia website in 2018. * If you are interested in becoming a homestay provider and hosting an international student in your home, contact the housing service of your nearest education provider and they will give you details on how to participate. Homestay providers can be single people or families (with or without children) from all different cultural backgrounds. The benefits of hosting an international student are numerous; at the very least, you should look forward to learning first hand about a different culture and making some lifelong friends!